They were all over the place when I was growing up, in town, around town and out in the country. Every few blocks in town or every few miles in the country, you had a place to stop, shop and visit with neighbors and friends. Of course, they were similar in some ways. Mercantiles in town sold dry goods. Mom and pops sold staple food stuffs and snacks and emergency items for your medicine cabinet. Country general stores sold all of the above. The nice folks who ran them were friendly and helpful. They knew everything there was to know about their merchandise and they could usually call you by name. My Powers grandparents lived for a short time at Cusaac’s crossroads between Elim and Olanta. Da farmed, ran a sawmill and a cotton gin while Mimi ran Cusaac’s general store. On my vacation visits, with a twinkle in her eye Mimi called me a plunderer and warned that “Curiosity killed the cat.” I had plenty of that and my love of mystery stories was probably a sign or symptom of it. Snoopiness, curiosity, and plundering were all of one cloth. The food section included refrigerated cases for sausages, hams, baloney, cheese and eggs, stacked shelves for canned beans, peas and Vienna sausages, and counters covered with glass jars of pickled pig’s feet, pickled eggs and just plain pickles. Sealed paper sacks of dried beans, sugar and flour sat side-by-side on countertops. Lard came in large, larger and largest sizes, pounds and pounds of lard in round, thin-walled tin canisters. Coolers of Dr. Pepper, Orange Crush, R.C. Cola and Pepsi’s stood side by side with wire racks of peanuts, cheese nabs and cinnamon buns. Ranging down several aisles were flat pallets holding assorted cloth sacks, rice, grits, and corn meal on one side, barrels of loose chicken feed and seed corn on the other. Mimi assigned me the job of sweeping up the spillage occasionally. I didn’t really mind. It was interesting to watch what happened when I tossed out the contents of the dustpan in the back yard. A fight inevitably broke out between Mimi’s red and white yard chickens, squawking hens wielding beaks like weapons over a few kernels of corn. A high-stepping rooster strutted back and forth like king of the hill, having to be satisfied with whatever his harem left of their mid-morning snack. Of course, farmers also needed saws, drills, nails, screws, mule harnesses, plows, parts for tractors and pumps, insecticide, fertilizer, cotton poison, you name it – and Cusaac’s had it all. Large items were kept fenced up outside with a strict hands-off policy for little kids, but I could browse, snoop, investigate and explore – in other words, plunder to my heart’s content inside. In later years I discovered Barringer’s Hardware in downtown Florence, the closest thing I ever found to Cusaac’s country store. I loved to enter the Evans Street side, peruse the window displays and slowly browse my way to the back door whether I needed something or not. The first electric kitchen appliance I ever saw was there in the front window of Barringer’s, a gleaming white electric mixer complete with round glass bowl and stainless steel beaters. There were no groceries in the hardware store but just about everything else covered the tables, walls, oiled wood floor and shelves. Need a mule harness or plow? Hammer, saw or nails? Perhaps the lady of the house needed a scrub board and tin tub, clothes line and clothes pins? Or a cast iron wash pot to make the lye soap, then boil the bedlinens in. There were even wooden baseball bats for little leaguers. Housewives and handymen (and secretaries like me on their lunch breaks) could rummage through bins and boxes and flats and shelves with screws and nails, electrical tape and extension cords, ladders and stepstools, plus assorted supplies for every imaginable household task. Bulky items hung from hooks down the entire left-hand wall and steps led upstairs to more of the same, extra inventory probably. Right down the same block was another hardware store, Schofield’s. Mr. Schofield sold similar goods and products, but he also had spare parts for most anything ever made, current or obsolete. Factory-closed-down, no-longer-made items that broke or quit working could be made like new again with a short trip to Schofield’s. If you didn’t know where to look, just ask – Mr. Schofield could point you to it or help you find it. It was said that he had a million parts in that store, and maybe it was true. My brother Harold remembers wondering – when Schofield’s moved to a new location, how on earth did they do inventory? Can you imagine what packing up to make that move must have been like? 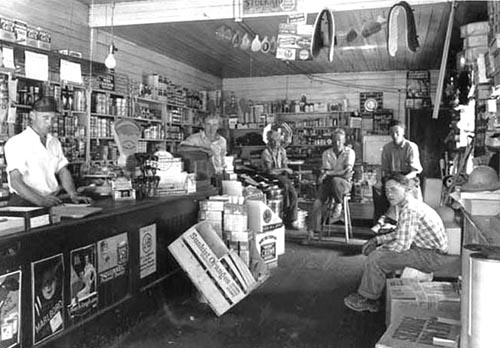 Today there aren’t many stores and storekeepers like those left. Of course you can find table lamps and table saws at Lowe’s, but if you ask a young store clerk what is the difference between wood glue and rubber cement or a wood screw versus metal, he’s apt to look at you blankly, shrug, and point to an “old timer” who still remembers the good old days of mercantile, mom and pops and general country stores.